TRANSLATION: to make six sesters of bochet, take six pints of good sweet honey and put it in a cauldron on the fire. And let it boil and stir as as long as it continues to rise up, and you see that it throws off bubbles like little globules which burst and when they burst they emit a little bit of smoke that is rather blackish. And then move it, and add seven sesters of water and let it boil so much that it goes back to being six sesters, and always stir it. And then put it in a tub to let it cool until it is just lukewarm; and then pour it through a cloth-seive, and then put it in a little barrel and add a cup of beer yeast because that is what makes it piquant (and if you use bread yeast, it is just as good for the flavour, but the colour will be more dull) and cover it well and warmly so it can work. When the toffee is ready, prep your water (make sure it's *hot*), put your safety equipment on, and rapidly mix the water into the toffee. It *will* splash up high, so be careful! When thoroughly mixed, allow to cool to body temperature, add yeast and pour into carboy, add an airlock and it's ready to go. 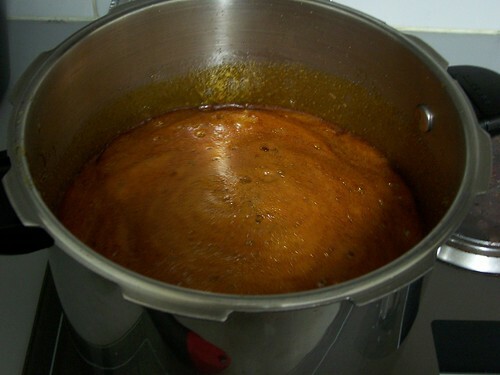 In the section that follows, I'll show you step-by-step what I did, including pictures so you can see the colour of the honey-toffee as I went along. If you're new to brewing, and especially if you've never made toffee before - I strongly recommend reading through all this before trying it yourself. In total, the cooking-time is about 2 hours. That includes prep and cleanup. 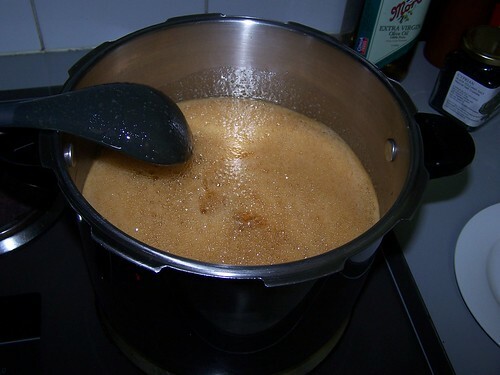 Most of that will not require your constant attention - the honey will boil away on its own with minimal supervision and stirring for about an hour... most of the activity will happen in the last 30-45min. 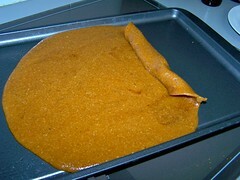 The most time-critical step is the part between when the toffee is ready, and when you pour in the water. Toffee goes from "nearly done" to "burnt now" in only about a minute - so it's especially critical that you prepare your equipment (especially safety equipment) ahead of time. Through the following section, I'll also discuss my choices and why I made them, some further information about the recipe in period, and some alternatives to use if you don't have access to what I used. This is a pretty simple recipe, when it comes down to it, so you've got a fair bit of flexibility in your alternatives. Note: please take the safety equipment seriously - this stuff splashes high *every* time you do the water-mixing step. In fact, if you have the option to do this outside, that would be best, but be prepared for a fair bit of cleanup, and keep children and animals well away. Put your two saucers into the fridge to cool. We'll be using those later to test the viscosity of the toffee. Check your yeast. If it requires preparation, you will need to start that now. It may even mean you need to start your toffee in a few hours' time... follow the directions on the package for the best results. Prepare your safety equipment and lay it out within arms reach of your stove - you want this stuff available at an instant! "take six pints of good honey"
Choosing your honey is probably "step 0" of the process. I chose a nice, dark leatherwood honey, rich in flavour (not random supermarket stuff). Honey-choice is really important in making good mead - it's worth paying a little extra for the better quality. The pale stuff you get from the supermarket is often cut with flavourless glucose (it's sweet, but that's all) to make the honey easy to pour. That's great if you want your honey to run easy onto your cereal, but if you want a nice, rich black mead, you'll need to choose something with a bit more body to it. Pick something up from a whole-foods place, or, better yet, find your local beekeepers hobby-group and buy some from there. Now, I didn't use six pints of honey... because I have a standard 1-gallon carboy, and I wanted it to fit nicely. In period, they would have used whatever brewing vessel of whatever size they felt like... but I've adjusted the recipe to fit 1 gallon to be convenient. So I used 1.5kg of honey. I used Pichon's estimate for the size of a sester (as described in Mead before Digby), which translates to approximately three pounds of honey per gallon which in metric measurements is just under 1.5kg. "put it in a cauldron on the fire. And let it boil and stir it"
Notice I'm using a *big* heavy pot. Heavy so the honey doesn't burn on, *big* because it swells up a *LOT* when boiling. You can see that it is now almost 3/4 filling the heavy pot - that's 1.5kg of honey in a 6 litre pot. I didn't have to continuously stir it, just every now and then while I was continuing to prep dinner. The next picture is about 1 hour into the cooking. You can see the honey is getting darker in the picture below. The longer-chain sugars in the honey break down into shorter-chain ones, and the colour changes as well - this is called "caramelisation", and it has been going on for a while, but by now it's becoming obvious. It's also just beginning to smell of toffee at this stage. 1 hour sounds like a long time, but I wasn't having to stir it much at all - just let it bubble away while I got on with other things (nearby, you don't want to leave it unattended). "it throws of bubbles like little globules that burst"
I figure things are probably going to change reasonably quickly now, so I make sure I'm standing around nearby and watching and stirring. So it's been a few more minutes, and now it's time to test whether the honey has turned into toffee yet. 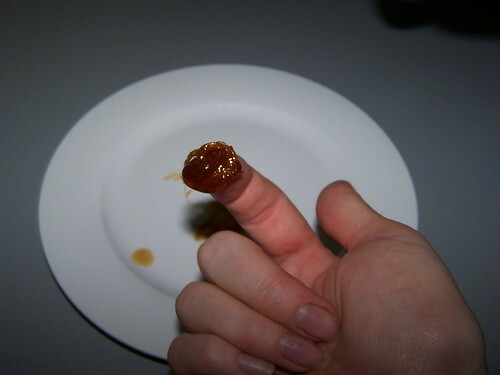 I took one of the saucers from the fridge, and dribbled a tiny dip of a teaspoon's worth of the honey onto a plate, it's now the consistency of soft toffee. It wrinkles when I blow on it. This is a good start, and it won't be long now. "as long as it continues to rise"
The recipe calls for black puffs of smoke... so I leave the honey on for a bit longer. I￼n the next photo, it's 1 hr 30mins into the process and you can see the honey is now very dark. When I stir it now, it takes a long time for the honey to rise again, and it does form those globules of big popping bubbles as it does so. It's "any minute now" territory... so it's time to put on your long-sleeve shirt. You can put the glasses and gloves on at the last minute, but a shirt takes a little time to put on, and this is the last calm before the storm. After that, you should get your 4 litres of hot water ready - in your easy-to-pour vessel. Have it close to hand. 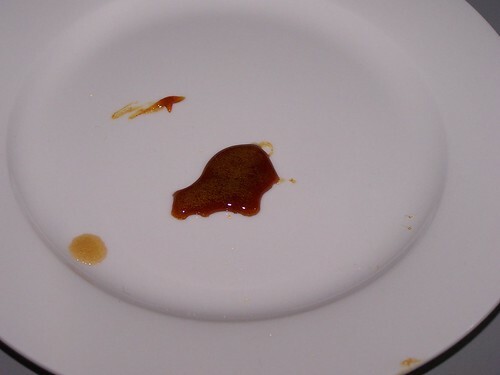 The toffee is now rock-hard when it drops on the plate. Still no black smoke, and it does *eventually* rise after stirring... but I figure I don't really want it to taste like charcoal, so for me, this is good enough. 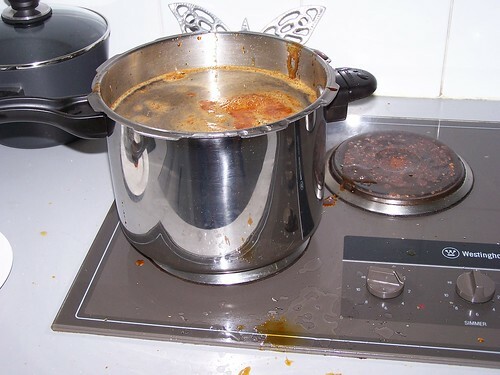 "then move it and add seven sesters of water"
Now, switch the stove off and if possible, move the pot to another (cold) hotplate. You are about to pour the hot water into it. Toffee and water (even hot water) don't mix very well. In this case, the first bit I poured in made it furiously explode hot toffee all over the stovetop (it jumped 25cm above the edge of the pot). I was unprepared for the viciousness of this bubbling, and I lucked out... but you are forewarned and should take all possible precautions so as not to lose an eye, or scald yourself into the ER. I've heard enough stories from people trying to make this stuff to be thoroughly convinced that serious safety precautions are in order. Put on your safety glasses and your heavy gloves now. Keep your face and hands as away as you can as you pour in half of the 4 litres of hot water. It *will* splash up a lot (it will leap over the edge of the pot). 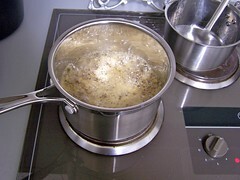 As soon as it settles, stir - if possible, stir immediately after pouring the hot water. This would be easier if there were two of you doing this - and then stir in the rest of the hot water. 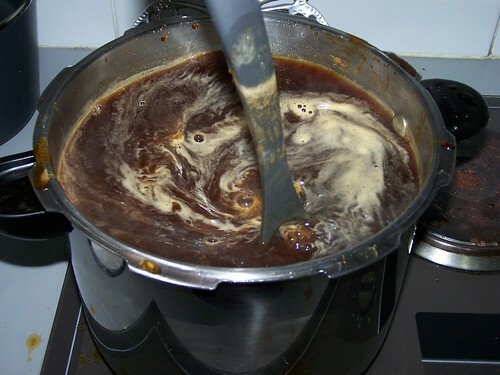 When I did this, it boiled and splashed up everywhere, and I was concerned that the toffee would harden and not mix in, but after the first pour, the mixing went fairly well, and you can see it mixed in nicely. "let it boil... [until] it goes back to six sesters"
You can see the colour of it: it's dark and rich. I chose not to boil it until it lost a seventh of itself. I just added a little less water to begin with. My decision was based on the fact that I don't need to purify my drinking water (I'm not using random river water) - and I didn't want any more charcoal-flavours from more cooking... so I just reduced the amount of water to add by a little instead. I did bring it back to the boil for a few minutes. 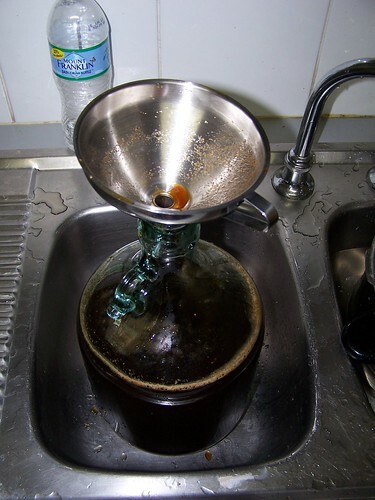 This ensures a sterilised brew, which gives the yeast a free run to get established. "let it cool... then pour it through a cloth seive"
Let it cool! This is an important step - as the brew will currently be too hot to pour directly into the carboy. if it's glass, it may crack, if it's plastic, it'll melt - either way, not a fun experience. Likewise, the heat will kill your yeast... So, wait until it's body-temperature before beginning this step. I actually forgot to pour it through a cloth sieve. That actually would have been a good idea. You can see little particles of crud sticking to the funnel - presumably the proteins in the honey all coagulated. But you can do it. Put some muslin into the funnel and pour the brew slowly through it, in order to remove the fine particles. In my case, the extra crud didn't change the flavour, but I had more lees to rack (including a few annoying fine granules that didn't settle out easily). Note: boiling honey (and skimming the scum which rises) was a common part of period mead recipes. The scum tends to be the honey proteins, which are normally suspended in the mead, but boiling it off causes them to coagulate, and removing them tends to lead to a clearer resulting mead. So if I'm right about the granules being the same stuff - straining them out might make the mead clearer... though the end-product of this recipe is so dark you can hardly see through it without a torch anyway, so it's up to you. "put it in a barrel and add a cup of beer yeast"
Well, I had been going to add ale yeast (one of the wyeast smack-packets), but turns out I didn't remember to get it started until way too late... and they really do need a warm-up period. So instead, I added my usual favourite: Lalvin EC1118. I like it because it's clean-tasting and quick and easy to use - it will start without preparation. It's also a very dominant species of yeast that will kill anything it its path (which makes it great when you use fruit which may have wild strains of yeast and bacteria that could lead to off flavours). The downside to EC1118 is that it's very high attenuation - which means it can put up with a high level of alcohol - which in turn means it turns a lot of sugars into alcohol... which means that your result will be quite dry. It was, however, the only thing I had to hand that could be added instantly and Just Work. In a pinch, you could likewise use a Safale yeast or other dried packet - most of which are usually pretty good at starting from scratch (rather than requiring a starter), but if you have time to prep - then it's best to do so and let the yeast get ready before throwing it in. "cover it well and warmly so it can work"
I popped an airlock on and left it in my kitchen, covered in a towel to keep it warm overnight. Here it is in the bottle the next morning. It's very dark. I really think this should be called "black mead". 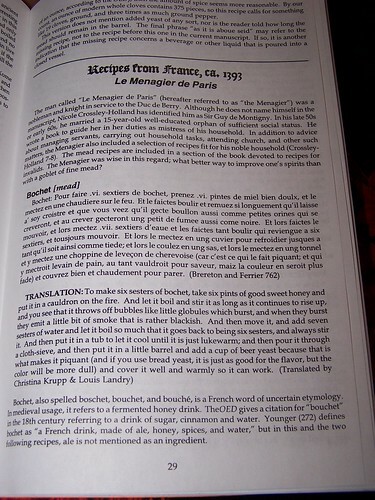 The modern terminology for a caramelised-honey mead is "bochet", but there are two other "bochet" recipes from "Le Menagier" listed in Mead before Digby that do not caramelise the honey at all. The author also points out that in period, "bochet" just meant a fermented honey drink (ie a mead) (you can see this discussion in the photograph in the sources section below). It seems that it is only in the modern-day that we use the term "bochet" specifically to refer to the caramelised version. In my (totally unresearched) opinion, I would have called this stuff "black mead" which I think is more apt. 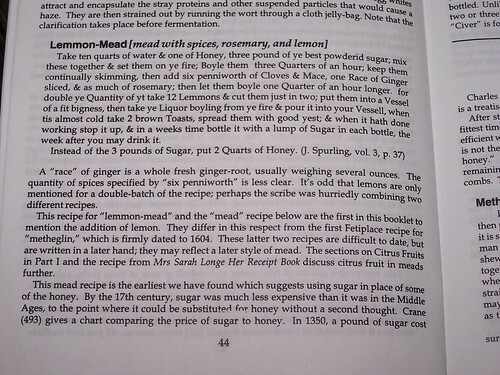 In modern usage "black mead" refers to melomel with black-currants in it... but it would not have had this connotation in period (at least, I've seen no recipes for such in any of our period sources, and melomels were only just barely in period)... and yet black mead was known at this time... so my guess it that *this* is a more likely candidate for the name. I left it in the bottle for about six months, and it is the most delicious-tasting thing - it tastes like caramel/toffee in a bottle. Really lovely, and a brew that I will repeat! I know I've harped on about this already a bit, but I have made toffee many times before... and even I was shocked at the ferocity of the water-mixing stage of this recipe. This time I lucked out... you are not likely to, and neither am I a second time.. so next time (and every time thereafter) I will use proper safety equipment. When I compared the end-sweetness of this recipe to my "normal" mead... I found it even dryer than usual. My (totally unresearched) opinion on this is that I suspect that the toffee-making process changes the availability of various sugars - it breaks long-chain sugars into shorter-chain sugars, and short chain sugars are much easier for yeast to digest. Thus the strong variety of yeast I used simply ate it all up. The result was nice, but I think it'd be even nicer if it were a little sweeter (toffee should be sweet, after all). 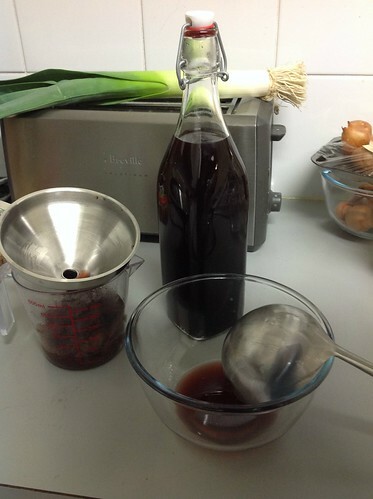 Defrutum is a roman syrup made by boiling down grape juice with fruit, used as a condiment, to add some syrupy fruity flavours to a wide variety of dishes. 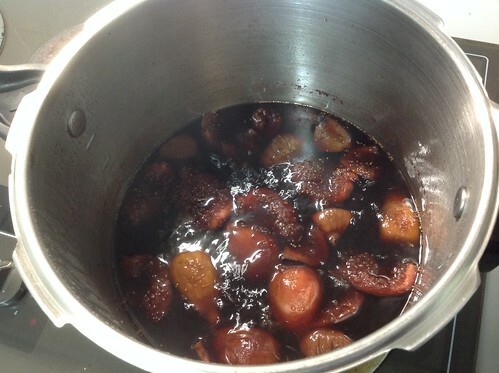 I took the recipe from the appendices of my book of Apicius, which describes it as being boiled with either quinces or figs, and that the best defrutum was boiled down to one half its original volume. 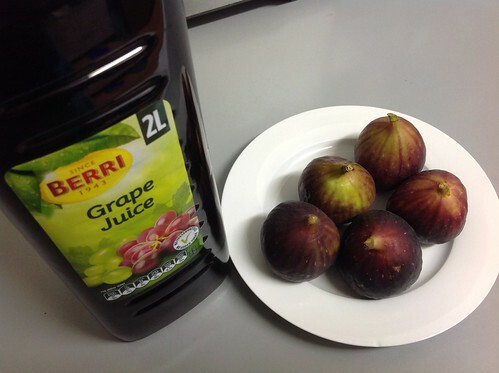 So I bought fresh figs, and dried, and added both to 2 litres of grape juice, and boiled them together until it was reduced to 1 litre. The fresh figs unfortunately suffered a tragic bout of shrinkage (nomnomnom) prior to arriving in the saucepan... but three fresh and three dried was more than enough to make it fruity and figgy. I boiled it for a bit over an hour - until the volume had reduced by half. Then strained it and funnelled it into a pop-top bottle, which I now keep in my fridge. I also should point out that I happily ate "figs boiled in grape juice with yoghurt" for dessert that night and it was really yummy! I find that it is a sweet, fruity syrup that has no real modern substitute that I know of. It is a great condiment to add to offset salty dishes and add depth and sweetness. I've been having fun with knitting stockings recently, and so when I spotted these knitted silk garters I just knew that had to be added to my "must have" list. Then, along came the Lochac largesse swap project - which is kind of like "secret santa" where a bunch of people join, and each of them gets the name of another person to make a present for within a certain timeperiod. I figured it was the perfect excuse, and began planning. Medieval Silkwork has an article on some publications of the York Archaeological Trust that includes a scanned page from the book "The archeology of York" - which shows three bent, extant metal knitting needles (copper alloy) found in the archaeological layer measured to be from the late 14th century. The rods are between 1.9mm and 2.6mm wide, showing that metal needles of quite a fine gauge were in use at the time. The garters above are knitted in fine silk. I sourced my silk from Handweavers studio in London. The silk is "30/2" weight - which I chose by the process outlined below. The original piece is measured at 4cm wide (presumably at the wider sections), and looking closely I counted the numbers of columns of stitching. The widest motif was 23 columns of stitches wide, and I estimated 2-3 columns of stitching on either side of that, making around 27 stitches for 4cm of width. I knitted up four test swatches using the smallest needles I had (1.25mm and 1.5mm) and two weights of silk... and decided that the closest match to the look of the original piece was the 1.25mm needles (size 0000 in US needles) with the "30/2" weight silk. The original piece was in dark red and cream... but the recipient of my largesse piece had arms in red and silver - thus why I chose the alternative colours. The original piece had both garters knitted in the same colour-scheme (red with white patterning)... but I didn't have quite enough of the red silk to do two garters that way (it took a *lot* of silk), so I particoloured, in order to finish them both without running out of thread. First step was to pains-takingly chart each of the patterns. This was accomplished with a zoom closeup of the originals and some graph-paper... They're on the flickr album (see last section). Some of the patterns repeat, and I noticed that some of the "same" motifs had very slight variations of each other. I have no way of telling if these were actual differences in patterning, or if they are simply repairs or if the stitching has pulled in ways as to make it seem different... either way I picked one variant that I liked for each and used them consistently in my own knitting. In the picture, the garters are clearly double-sided (the patterns are equally on both sides). However they're also incredibly flat. I looked closely, and to the best of my ability to zoom-in they appear to be stocking-stitch on *both* sides (the "straight" edges of all the knitted motifs have v-shapes on *both* sides of the knitting - which is only every found on the stocking-stitch side of knitting, not the perl-side). I really wasn't sure how to achieve this effect easily without doing circular knitting, or doing the patterns twice and stitching them together. It's plausible that the stocking-stitch assumption is incorrect - that it's actually knitted in garter-stitch but the picture is too poor a quality to accurately reflect what it looks like. It's also plausible, that the pattern-motifs *aren't* knitted-in via intaglio, but were actually embroidered on afterwards... in any case - I chose to knit the patterns in. Partly because it would be more fun. I decided not to drive myself crazy(er?) and knit with circular knitting - but to knit it flat then stitch it up afterwards. This meant that it doesn't sit as nicely flat due to one side having a seam... but was *much* quicker to knit. I knitted an average of an hour per day for six months in order to finish the garter - for a total of about 200 hours of work (including finishing). I woefully underestimated how much work was involved in these - and TBH, I'm glad I did or I'd have never started this project... and I'm glad I did. it took so much time because - even though the garters are very narrow... they are 27 stitches wide... and double sides, making 54 stitches per row... and they are 165cm long... which is roughly 1113 rows. And there's two of the garters. Little man with either a spear, or maybe a tall, narrow tree - there was one of these at the very centre of each garter. I joined the seam with an invisible seam technique that I leartn when I was a kid, but which I googled and you can find an article here where it's called mattress stitch. This meant that even though it doesn't quite sit flat - you can't really *see* the seam from the outside, and it looks just like it was knitted in the round. The final piece was the tassles. These were easy to make... I was going to use a simple four-part braid for the thread holding each one on, but on closer inspection of the originals, I noticed that the colours were vertical stripes... so in the end I used a simple kumihimo technique (doing it freehand) where you simply swap the alternate colours, but one pair goes clockwise, and the other anti-clockwise, thus twining each around the other, and locking the other into place. This looked identical to the originals, so I assume it's what they used. the one thing I didn't do like the originals was use an embroidered bead between the ends of the garters and the set of tassles... something that I think would have greatly improved the look of the garter's ends - which otherwise look a bit stumpy to me.... ah well. I didn't leave enough seam-allowance in order for the garters to look balanced - especially in the narrowly-defined section that increases from the ties to the wider parts. I left only 2 extra stitches, which seemed like a lot during the knitting, but didn't quite stretch over the extra width of the seam. Technically I only needed one stitch to be stitched into the seam, but the bend of the knitted fabric around the seam caused some extra in-drawing of the fabric. An extra stitch would have made the two sides *look* more even. If I were to do this again, I'd figure out how to make the embroidery-covered beads to make the ends look less like they just... end. Really, I'd like to actually go to Boston and look at the originals and see how they were really made. Check my assumptions and fix any errors there.I'd especially like to see how they were really made flat - whether the motifs were actually knitted-in at all. 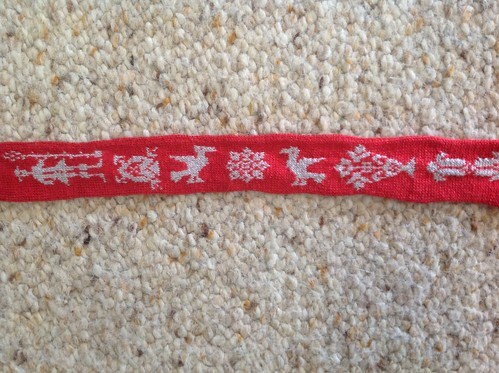 For more pics, I have set up a knitted garters album on flickr. I'll keep adding my pics there as I get around to uploading them. 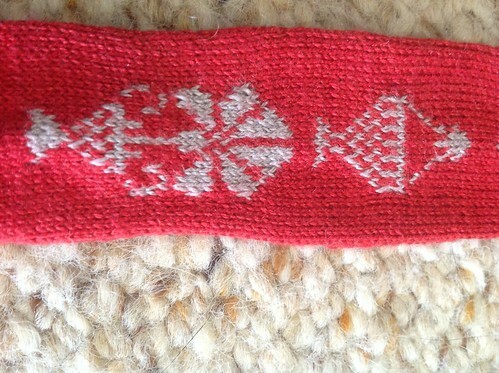 The album includes photos of the graphed patterns of the motifs (not prettified, just raw). Sadly, I no longer have the garters in my possession. They were given to Janet Coath as her largesse project. I'd love to see pictures of her wearing them! So, my latest fibre project has been a knitted Monmouth cap. 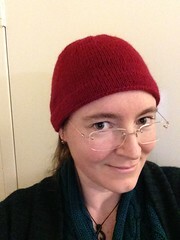 This is because the new Festival site is freezing, and I was forced to abandon all pretence of Periodicity (in favour of not losing my ears to frostbite) and wearing a modern hat. So this Festival, I'd like to have at least two Monmouth caps to keep my head warm. The original monmouth caps were knitted in wool and then fulled for extra wind-cutting protection. Now, m=fulling is not a skill I'm good at yet - so I decided I'd start by knitting a well-fitted one in unfulled wool first - to get a gauge on the pattern I'd require... then I'd make one slightly larger to full. 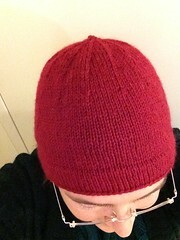 So my first cap is knitted in a nice, red 8-ply wool. The only current extant monmouth cap is brown in colour with quite thick wool - but tudor knitted caps and accounts of the time-period describe caps of black and sometimes even red. Thus my choice of colour. The extant one is very thick wool (what would perhaps be a modern 12ply), but finer caps for gentleman were apparently known - and tudor flat-caps are also in much finer weight - so I'm fairly happy that my choice of wool for this project is not too far out of line. It's turned out really nicely. two pairs of circular knitting needles OR two sets of double-pointed needles (at least 7 needles total). I used 4mm (size 8) double-pointed needles. about 100gm of 8ply wool (usually 2 balls). some kind of measuring tape and probably a wool needle. Note: I'd avoid slippery-smooth wool with double-pointed needles first your first go-through, unless you're a reasonably confident knitter - as it makes it just that much harder. 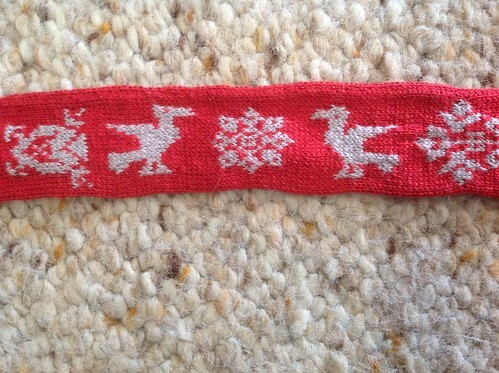 The knitted swatch is a non-optional choice when making a hat. Hat's must fit you closely. Too large and they will be loose and won't keep you fully warm, too small and they will creep up off your head. 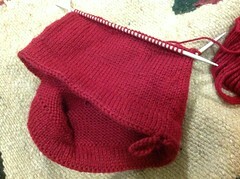 So a swatch will give you an accurate gauge of how many stitches to cast on to give your hat a cozy fit. 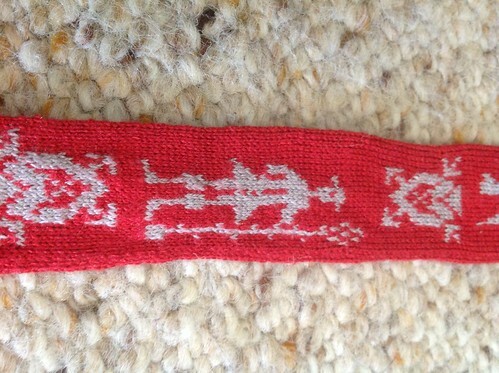 I knitted a swatch that was about 20 stitches wide and only knit it for about 6 rows. you don't need to worry about row-height as you'll figure that out as you go. But width is very important. Then I took the measurement of my head in cm and multiplied like this: stitches = Sper10 * HeadMeasurement / 10. If I used the "lying flat" measurement, it came to 134 stitches. With the "slightly stretched" measurement it came to 112 stitches. I chose to use 120 stitches. It's a good compromise between the two, and 12s have a lot of factors. Given that part of the Monmouth-cap pattern requires you to do regular decreases, having lots of factors to divide the stitches by is really useful - because it gives you lots of options. You should also measure you head "height". I recommend measuring from left ear to right ear - making sure you pass the measuring tape over the crown of your head (which is far to the back of your head). You want the tape to go over the direct centre of where your hat will sit. Have a look at where the crown of my cap sits on my head in the picture, for reference. For me, that measurement was 45cm. About half of this is roughly how many rows we will be knitting in total. If you look at my pic above, you can see that roughly one third of this "height" (from ear-to-ear) is in the top-section, the part with the decreases. With another third each from there to each of my ears. So one third of my "height" number should go into the "body" of the hat (the cylindrical bit that we knit before we start decreasing). Remember that number. So now I had my stitches, I could cast on that number. A hat is circular in nature, so it calls for circular knitting. you can use a circular needle if you like, or go full-period and try proper double-pointed needles. You can either use three or four needles - whichever feels more comfortable for the number of stitches. Just divide the number of stitches evenly between them. You can use whatever cast-on technique you like, but be aware that later you will be picking up stitches along the cast-on edge (to join the brim to itself). So I personally chose the crocheted invisible cast-on technique, which allowed me to transfer the bottom-row of stitches directly to my other set of needles later. When you cast on, leave a long tail of wool at the end - at least 20cm. You now knit the brim. Now preferences for how big to make the brim vary. I like a reasonably wide brim because it will be double-layered and go over my ears to keep them warm. You might like just a narrow one - just enough to provide a stretchy edge to keep your hat on your head. The cap pictured has only 8 rows, and my next cap will have 12. I'd recommend no fewer than 5, but the upper-limit is up to you. So, I knitted 8 rows. 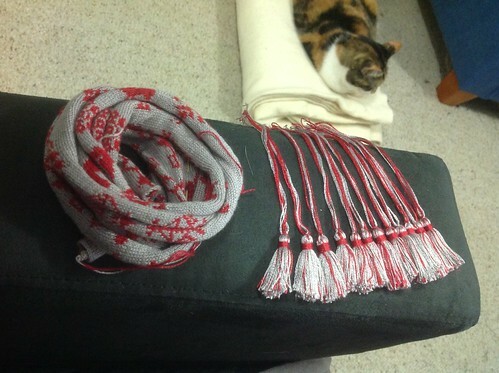 as I went, I passed the tail back and forth so it wove in and out of the knitting as I went. this isn't entirely necessary - you can leave a "float", but I figured it kept it neat. Then I purled one row. This is the row that is the turn-row and will be the bottom-edge of your cap. 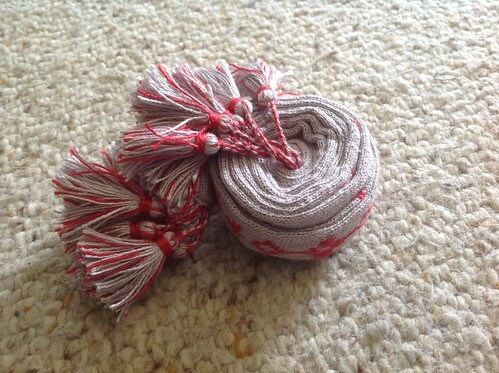 It must be purl to create a neat groove in the knitting with which to fold neatly. Now... knit just two more rows and stop. the extant pics of the monmouth caps seem to have a row of what could be "cast on" stitches... but I think look far more like a row of crocheted loops. I experimented with doing this on my own cap, and decided a) it looks pretty and b) it creates a stronger edge to the cap, which would lead to it being less likely to stretch out of shape. So I think it's a good idea. So I did it at this point. Hold the ball of wool "inside" the circle of knitting (on the wrong side of the knitting). Your crochet hook is on the "outside" of the knitting. Push your crochet hook through the knitting just *above* the line of purl stitches (into the first "V") and draw a loop of the wool through to the "front". Make sure that the wool is reasonably tight. You don't want any slack causing the very last *knitted* stitch to be all loose. Pull any slack through to ensure this. Now move the crochet hook to the next purl stitch and do this again, drawing the next loop through the loop currently on the hook (and letting the first loop slide off the hook). Continue like this around the whole brim of the hat. Be careful not to make loops into every half-stitch. Make sure there's one loop for each "V" of knitting - it sits better that way). When you get to the end... don't let go of the last loop. you are now about to make the "loop" that is characteristic of the monmouth cap. I wasn't at all sure what the loop was for - until a friend suggested that it would be perfect for hanging your cap on a hook on the wall - either to let it dry or just to store it. That sounds good to me, but it would need to be fairly sturdy - in order to take the weight of a sodden wool cap. Thus I decided to make sure this loop was double-thick. Grab the long-tail of wool from your original cast-on, and add it to the current ball-wool so that you are now going to crochet with both strands of wool at once. Use these to crochet a chain. The length can be variable depending on how long you'd like the loop to be./ I'd recommend around an inch in length. Now, with the loop currently on the crochet hook - pull the wool through to make the loop bigger (be careful not to pull through the end of the cast-on tail). Bring the tail+ball over the edge of the knitting and through this loop, and pull the loop closed to finish it off. Now, with your crochet hook, push it through from the *back* of the knitting, through the *second* of the very-first crochet-stitches you made, and draw the remaining "tail" (from the cast-on) back through to the back of your knitting. So, now you're ready to continue knitting. You can just put the ball of wool back where you need it to continue knitting. I knitted another 6 rows, so that the total number of rows on this side of the brim was also 8 (to match the first 8 rows). Obviously you'll continue until you reach the number you want. First: fold the brim so that the "wrong" side of the knitting is hidden away, and the bottom edge is matched to the top edge. These should match well. If they don't - you've either knitted one too many, or one too few rows... fix that before you continue or you'll be sad when the brim doesn't sit right. Now - you need to pick up stitches from the bottom edge using your second set of circular needles. obviously - it must be exactly the same number of stitches as you initially cast on. The really tricky part is next. Hold the brim so that it's folded correctly and you have the two sets of circular needles next to each other. 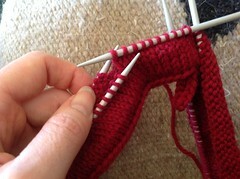 You are now going to knit a stitch from each-needle together to seal the brim edges together. 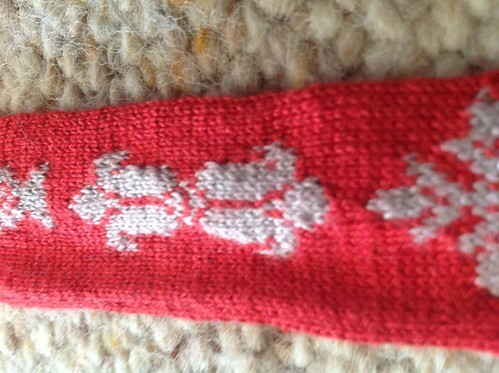 To do this, for each stitch you will work a variant of "slip one knit one, PSSO", but with two needles. I'll call them "front" and "back" needles. slip a stitch from the front left-needle onto your right-hand needle. Do this all the way around, until you have just one row of stitches once more. Congratulations, that was the trickiest part. It's all downhill from here. Step 7 - the "body" of the hat. So earlier we measured the "body" of our hat... so now... you just need to keep knitting until your knitting (including the brim) reaches that length. At this point there should be about 6-8 stitches left. Cast these off - and the knitting will naturally form a little round "button". you can make this bigger if you like... but this is where I stopped. Provides a good overview of period monmouth caps (including a picture of the only extant one) and an alternative pattern (with pics of the knitting as she goes along). 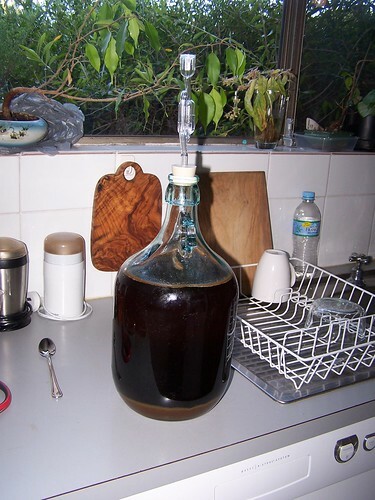 I've been making a lot of home-brew wines in preparation for festival. Over the next indefinite-time-period I'll put them all up here as tutorials. To start with, though, here is the one I put on just this weekend. I've been making home-brew wines for quite some time now, but my speciality is in meads - which are wines made from honey instead of grapes. So I quite like to try new mead recipes. This one piqued my interest because it not only has "lemmons", but rosemary and ginger and a little spice - so it looks set to become quite a tasty brew. It's also made with a ratio of honey-water that puts it fairly within my preferred sweetness-range. The recipe comes originally from the "Complete Receipt Book of Ladie Elynor Fettiplace", but I have the redaction from Compleat Anachronist #120. I guesstimated the amounts for all these based on the ratios in the recipe, and my own personal experience and taste. A heavy-bottomed-pot - it will need to be about a gallon and a bit in size. A primary-fermentation container of some kind. It must be big enough to hold a bit over a gallon of liquid and have a lid that can be closed almost-completely. I use a giant tupperware container and close it up except for one corner. Step 1: "take... water and honey... and set them on ye fyre"
Put the honey into the pot. Add about 3 litres of water and stir them well together. It'll look quite cloudy. Turn the heat onto medium and let it begin to heat up. Set a timer for 45minutes, or just mark the time on the clock and keep an eye on it. 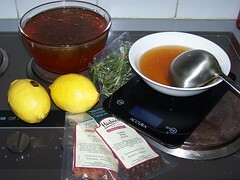 Step 2: "take... six penniworth of cloves & mace, one race of ginger and as much of rosemary"
Prep your spices. 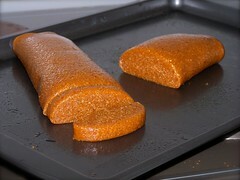 Take your ginger and slice it reasonably thinly. 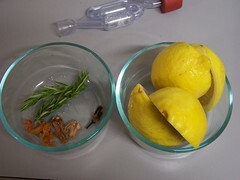 Put aside the cloves and mace, and rinse the rosemary. You might as well cut your lemons in two while you're at it. You should also start your yeast now by putting into a warm cup of water. Meanwhile, back at the farm.. Step 3: "...keep them continually skimming"
By now, the honey-water will be boiling. Keep it to a simmer, and skim the scum that riseth - tipping it out into a bowl. Step 4: "then add [the spices] and boyle them one quarter of an hour longer"
Once you've boiled and skimmed for 45min, drop the spices and ginger into the pot and let it boil for another quarter of an hour. Step 5: "take [the lemmons] and put them into a vessel ... take the liquor boyling from the fyre & pour it into the vessel"
Your primary fermenter is likely plastic, so it'd be a bad idea to follow the directions literally and pour the hot water into it. 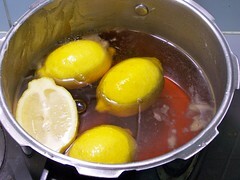 Instead, drop the lemons into your pot, put a lid on it and allow it to stand somewhere to cool down. Step 6: "put them into a vessel of fit bigness... when the liquor is almost cold... [add] good yest"
Hopefully your yeast has started frothing now. 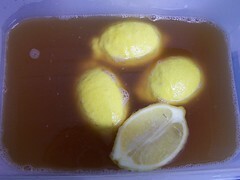 When the liquor is blood-warm, pour it into your fermenting vessel (lemons and all) and mix in your yeast. Step 7: "when it hath done working, stop it up"
Now just leave it to go for a while. What the instructions mean here is that when it has done with the really super-frothy stage - you should transfer the liquid to your main carboy (without the lemons), and let it continue to ferment. It's done when it's clear, and the recipe suggests you bottle it in sparkling-wine glasses with a small amount of sugar in each. I've been knitting since I was eight - when my Gran took me aside and taught me, to keep me occupied and out of my parents' hair when my first sister was born. Since then I've knitted a fair number of things for myself and others... but I've done very little knitting for the SCA as yet because, given a choice, I generally prefer to try *new* things, rather than re-hash old ones. My first idea was to make some Egyptian Knitted socks, and I've knitted up a sampler for that (which I'll write up and link to later), and hunted (for years) for some wool of the right colour, before finally giving up and getting a friend of mine to dye some white wool the correct shade of blue. All I'd ever seen or heard of period knitting was that it was very simple, stocking stitch with some minor decoration around the ankle (known as "clocks"). I'd never seen *pretty* knitting, apart from the egyptian-style patterns... and I decided at once that I must make a pair. I spotted the pictures on the Realm of Venus page Stockings of Eleonora de Toledo, 1562. Apparently, the full-length, stretched-out version of the stockings (below) is a recent-addition to the world. They show that the stockings don't follow the usual European heel-turn method (of heel and foot flaps with a triangular short-row section, and, to my eyes, seem to indicate that the foot was knitted as a whole - with the instep being knitted as increases that makes the foot fit. I chose to make mine in wool instead of silk, because a) it's cheaper and easier to get a hold of and b) it's more forgiving on fit...and given these are my first I can do with that small advantage... because basically I'm making it up as I go along. As of February 2013, I haven't completed these (though I'm now most of the way through my first stocking), and I'll post pictures as I go. Not so long ago, I realised that while I do a lot of cooking, I don't have a very big range. Mainly I cook the same kind of pseudo-italian pasta-sauce-like things over and over in slightly varying degrees, with the occasional fusion-thai-style dinner for variety. To kick that, and push my boundaries a little, I've been pushing my cooking comfort-zone. Partly with new mundane things (eg bread), but also with the occasional medieval dish - because why not? Makshufa - what is it? 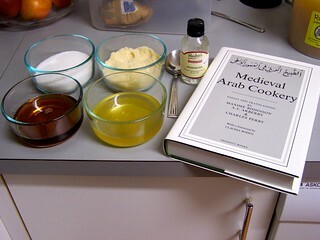 This dish is a medieval sweet-meat - an almond Halva, made from the Medieval Arab Cookery book (here pictured). This book combines a number of period arab cookery books and contains heaps of fantastic and tasty recipes - and I plan to cook a whole bunch of them in time. MAKSHUFA. 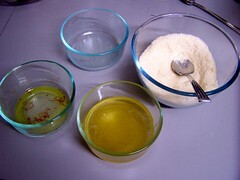 Take equal parts of sugar, almonds (or pistachios), honey, and sesame-oil. Grind the sugar and almonds, and mix together. 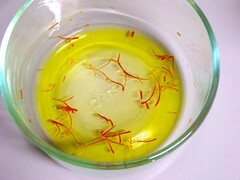 Add saffron to colour, mixed with rose-water. 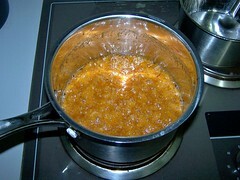 Put the sesame-oil into a basin, and boil until fragrant: then drop in the honey, and stir until the scum appears. Add the sugar and almonds, stirring all the time over a slow fire until almost set: then remove. You will need equal amounts of the first four ingredients - to make a small "loaf" of halva (see pictures below). You will also need a heavy-bottomed-pot preferably a much bigger one than you'd need to fit the ingredients, as it will bubble and froth like crazy. 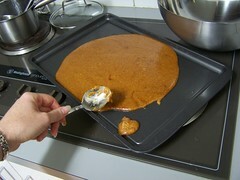 You will also need something onto which to pour the hot halva. I find that a lightly-oiled lamington tin is perfect. I'd also recommend setting aside a couple of saucers for testing "done-ness" of the halva-mix during the toffee-making phase. A big, heavy knife and a cutting-board are also good for cutting it into pieces. Do this if you think your halva will be fairly solid, as cutting it while it's still warm is much easier than when its gone solid. Saffron takes a little while to steep, allowing the colour to come out so I'll generally start it early. The recipe just calls for it to be added... but I'm quite certain that the cooks of the period would have realised that it was the steeped saffron, rather than the strands alone, that is to be added. 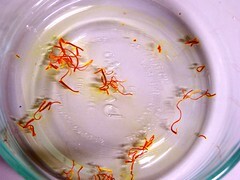 To prepare, put a very small amount of warm water into a bowl, and add a pinch of saffron. I also add the rose-water (just a half a teaspoon full) so there's a little more liquid without there being too much plain water. Then leave it to one side while you do all the next steps - but don't forget about it! Getting your equipment ready early means you're prepared to quickly move to the next stage no matter what happens, and I find that in this recipe, things move quickly! So I prefer to have mine prepped and ready to go from the beginning. In this case, you need your big pot on the stove, and your lamington tin very lightly oiled (a teaspoon smeared out to the edges works for me). Put the lamington tin in easy reach onto a heat-proof mat or trivet. I'd also put two saucers into the fridge (for testing done-ness). Being cold makes it much quicker to test whether the hot toffee-like stuff is ready. Put a knife and cutting board to one side for cutting it up while still warm. The recipe calls for pounding the almonds and sugar - but I cheated and just bought almond meal and table sugar. You can grind your own if you like - fresh-ground almond meal does have a much better flavour... but there's also something to be said for convenience. So at this stage, all I did was mix them together. Meanwhile, in a pot I began to warm the sesame-oil. Once it's warm it will indeed begin to smell wonderfully fragrant - at this point you can pour in the honey. It's unlikely that modern honey will have very much scum - as mostly modern honey is filtered for all the bee-parts, pollen and wax. You will get a small amount of scum, which is the proteins of the honey. It's up to you whether or not you want so skim it off - it's in no way bad for you, and this recipe doesn't require crystal-clear clarity, so I'd just mix it back in. 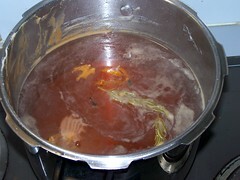 Don't let it get too hot - leave it on a low simmer. 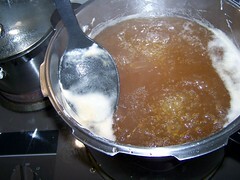 When your oil and honey is nicely warmed and starting to simmer, it's ready for you to add your other ingredients. Don't let it be too hot, because it will burn the almond-meal. Just a light simmer will do. Please be very careful when adding the other ingredients - they will cause the very hot, very sticky mixture to bubble and froth! Add the almond meal/sugar mix, and the saffron/rose-water too; stirring quickly to get it mixed in well and not all lumpy. Step 5: "stir it over the fire until almost set"
The next stage is to just let it simmer on low, letting the sugars caramelise. Determining how long this should be is a black art, with the answer being "until it's ready". 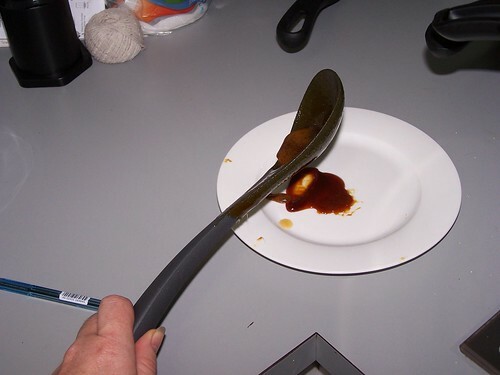 You can tell it's ready if you drop a half-teaspoon-ful onto a *cold* saucer (from the fridge). If you tip the plate and it runs across the plate - it's nowhere near done. If it doesn't move at all it's done! take it off the heat! 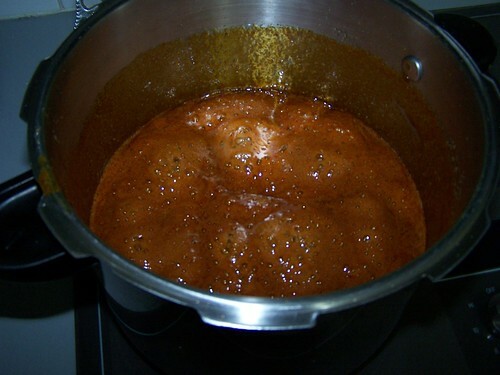 If it kind of gloobs over to one side, carefully push at it with a fingernail or spoon - it should feel like treacle - at which point, take the pot off the heat and go to the next stage. Pour it out onto the lamington tin. Now and then, push at it with a spoon. You'll want it to be not too hot to manipulate, but you want to get to it before it goes too solid to play with. The runniness can be deceiving... the picture at right is when it's just been poured out and it still too runny to move - it looked to me like it'd be way too soggy to cut, but this halva actually went nearly rock-hard when cool. Roll it up, then cut it into bite-sized chunks and serve it forth. Enjoy. I recommend keeping it in an air-tight container to maintain the texture. All content (including images) copyright Taryn East 2013. Awesome Inc. theme. Powered by Blogger.